A small collection of one-offs, including a number of ‘alien invasion’ shorts that he scripted himself. This character can't cope with the awesomeness of being drawn by Henry Flint. Shakara – and a whole host of delightful alien beings, but the eyeball hovering above a spindly body is especially fondly regarded. 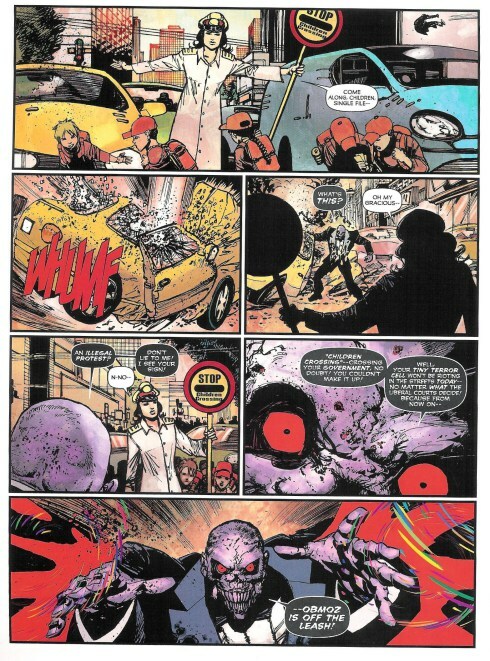 Being able to channel great artists of 2000AD’s heyday (from McMahon to Ezquerra to O’Neill); creating new characters and series for others to run with (The VCs reboot; Banzai Battalion, Low Life; movie Dredd as a strip); an enormous imagination; pouring crazy amounts of details into every panel; wild eyes. Chief Judge Hershey is CROSS. Henry Flint is the real deal. 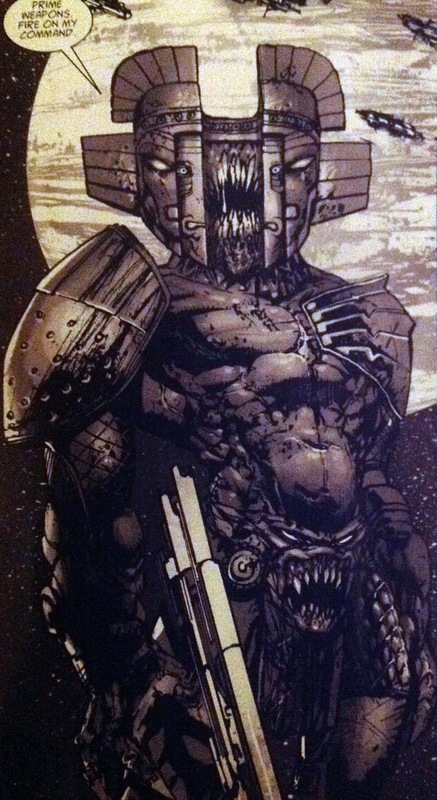 Steeped in 2000AD history, birthed in madness. Flint’s skills famously allow him to combine a diverse range of legendary art droids, but really he’s always been his own thing, and has used so many different styles across a 20-year career for Tharg that I’ve lost count. And he’s managed to write a bit as well, following a comedy tradition in the vein of early Kevin O’Neill, to name one example. Fr1day rolls into action, teeth gritted. Flint burst into action with a stint on the Friday version of Rogue Trooper – specifically, when script duties were taken on by military jargon fan Steve White - and this incarnation became something of a pure action-stravaganza, with side-issues of continuity-bodging that are frankly best ignored. But the art was glorious! It was cartoony yet gritty. Zingy. Poppy. Chirpy. I’m reduced to onomatopoeia here. Which is telling, because you can’t hear art, but you sort of can hear it when Henry Flint is behind the pen. Who else has drawn ALL the GIs? And made them look badass, too. He took on a few Dredds pretty soon after that, and has in the fullness of time become someone that Tharg (maybe guided by John Wagner?) turns to for the big epic game-changing storylines, which is as good a way as any to notice that he is a most-favoured artist. 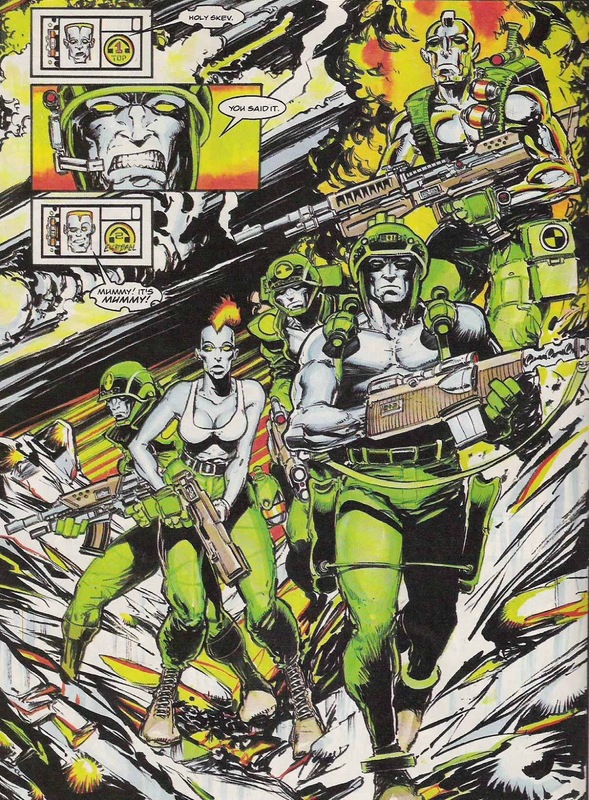 A position he may have held surprisingly early on, given that he earned his own Judge Dredd poster-Prog very soon after he joined 2000AD, following on from long established greats Carlos Ezquerra, Colin MacNeil, Greg Staples and Cliff Robinson. 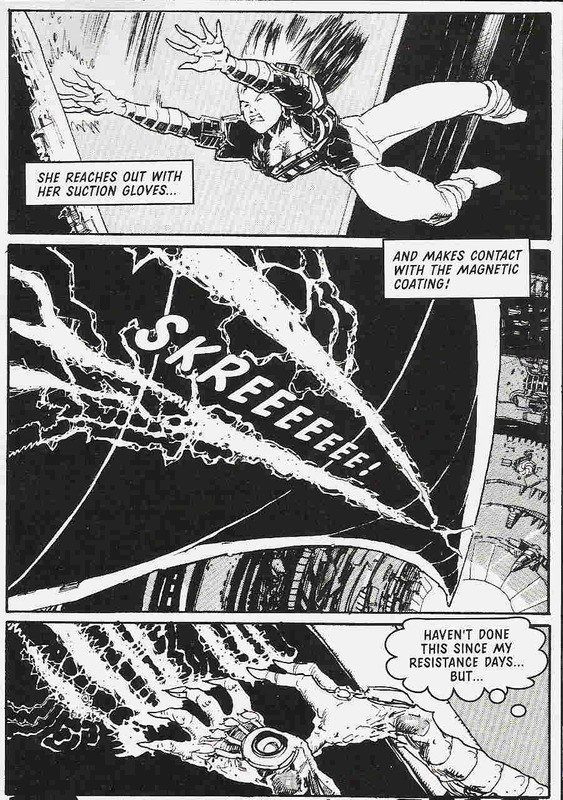 I suspect that some readers back in the early days may not have been fans of Flint’s cartoony style, coming as it did in the middle of the fully painted, gosh, aren’t comics grown-up era. Sancho Panzer was perhaps an early victim of this problem. It was one of those strips that should have worked great on paper – Abnett on puns, Flint on massive tanks – but for whatever reason neither the writer or the artists quite pushed the strip beyond the level of ‘good enough’. You'd think I'd show a panel from Sancho Panzer here, but I don't have any to hand. 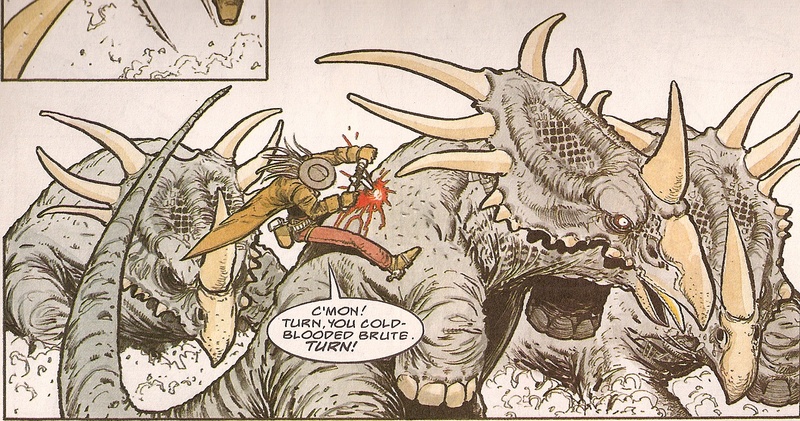 But Preacher Cain hitching a ride on a Styracosaur makes much the same point. If there was a turning point that brought everyone on side, it was surely when Flint was tapped to draw 9/10 episodes of Nemesis the Warlock Book X, doing his best to live up to Kevin O’Neill’s mighty legacy – and then outdoing the master himself on the following yeas’ Deadlock (which is basically Nemesis the Warlock Book XI). Moving past O'Neill and just doin' the Flint do. This gave rise to Flint’s status as a full-on creator, setting up opening series for the new VCs and LowLife - and he was surely the right choice for this series that is all Dreddverse, but also has overt meta-ness that focusses on featuring protagonists that'd never be the lead in a movie ('ugly' men and women,obese people, the elderly, and tiny babies). Meanwhile lending his considerable imagination to a neverending stream of alien weirdness (and a touch of horror) with Shakara, and, later on, downright lunacy with Zombo. 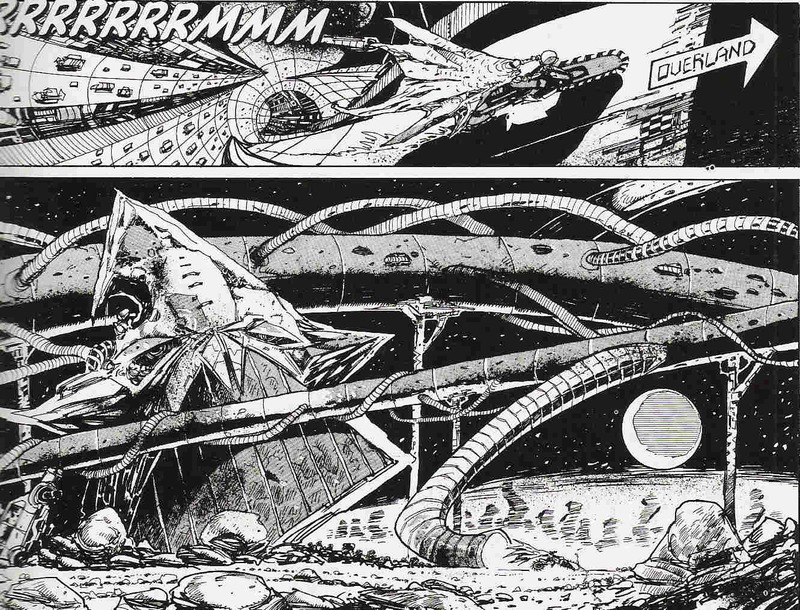 If I’m honest, I haven’t fallen for Zombo the way I did Shakara, but it’s a true treat for the eyes. Flint doesn’t always add his own colours, but when he does, as with Zombo, the detail is phenomenal. It's very much worth noting that Zombo was Flint's idea in the first place, especially the 'death planet' setting of the first book. It takes the mind of an Al Ewing to keep up with the Flint-y craziness of the concept, too. One of many AMAZING but ultimately short-lived Shakara foes. What do you call evil Zombo? I guess one of the greatest achievements for a 2000 AD creator is to be fondly associated with a wide variety of series and creations. Flint is one of those hallowed few. 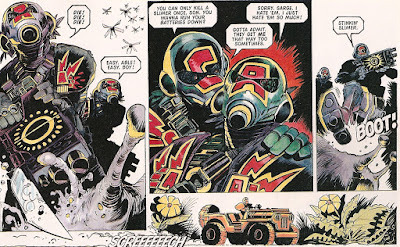 He gets to draw key Judge Dredd episodes, have his own mini-comics in the Prog, and seems as likely to be seen reinventing an old favourite as he is diving headfirst into something completely new. Henry Flint – he’s here to stay, we love him, keep him in the Prog, Tharg! 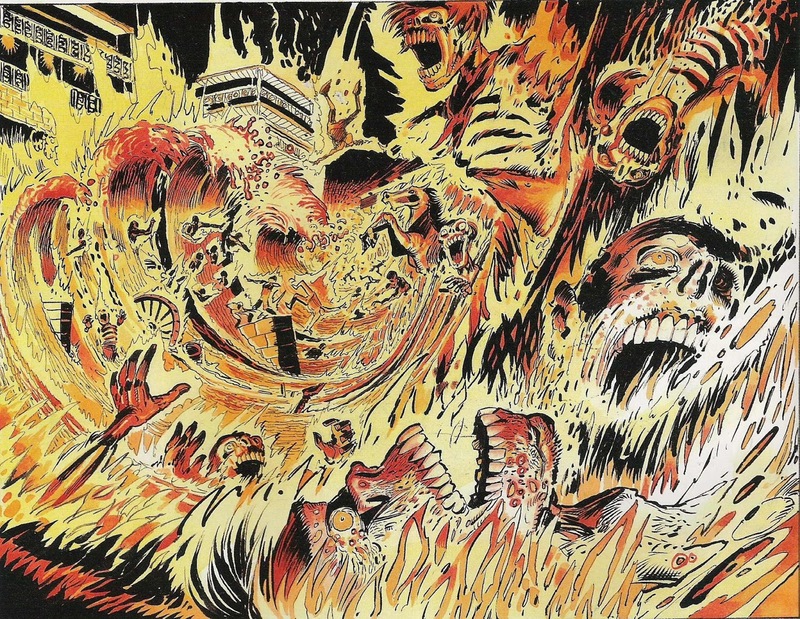 Fiery Apocalyptic death during the Total War debacle - the first greast Mega-Epic of the new Millennium. Shakara: artwise, all of it! He hasn't posted for quite a while, but Flint's blog is still online.